I’m finding it very hard not to lick my computer screen as I’m writing this. I’m currently on a self-imposed sugar ban for a bit and frankly looking at these pictures is making it very difficult to hold on to my willpower. I love dessert and while it’s not something I would ever give up, let’s just say that we were eating it a little too often for a time period there. So I’m trying to take a step back for a bit and have only been having a cup of tea at night before bed. It hasn’t been all that bad … until I went to edit these pictures. Because the rich, fudgy brownies topped with a thick layer of creamy dreamy irish cream frosting staring back at me are not helping one little bit. And seriously, these are crazy fudgy. Not cake-like at all – more like a flourless chocolate cake even though there is flour involved. Now let’s talk about the stout factor. 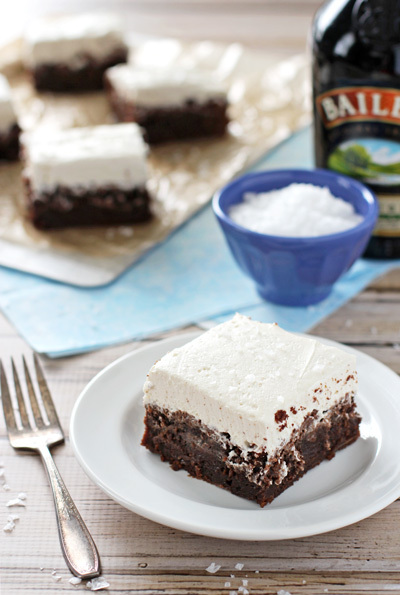 I said it about this chocolate stout cake and I’ll say it again about these. You don’t actually taste the stout – it just really intensifies the chocolate flavor – making them outrageously chocolaty and obviously plate-licking good. And did I mention that these are finished off with a dusting of sea salt? A little salty, plenty sweet and boozy? Now that’s one heck of a combination right there if I do say so myself. 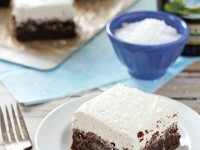 Recipe for chocolate stout brownies with irish cream frosting. 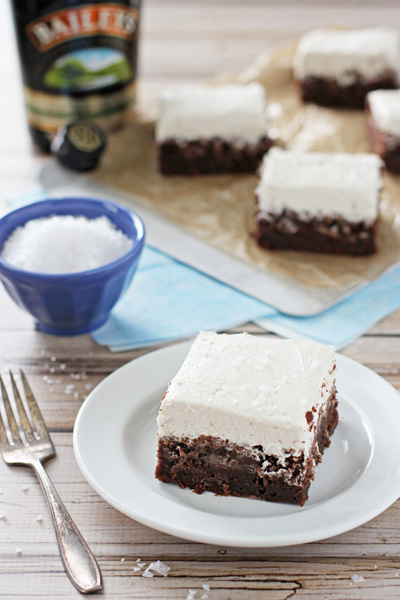 Rich, fudgy brownies topped with a thick layer of frosting and dusted with sea salt. To make the brownies – preheat the oven to 350 degrees. Line an 8×8 inch baking pan with aluminum foil (leaving an overhang on the sides) and then spray well with non-stick cooking spray. Set aside. Add the stout to a small saucepan. Bring the stout to a boil then reduce the heat to a simmer. Allow to simmer until reduced to ¼ cup, about 5 minutes (keep an eye on it – you don’t want it to burn – every so often I’ll gently swirl the pan). Set aside to cool. Cut the butter into chunks and then add to a heatproof bowl. Add in the chocolate chips. Set the bowl over a pot of simmering water (don’t let the water actually touch the bowl) and stir occasionally until the mixture is completely melted and smooth. Carefully transfer the melted chocolate mixture to a medium bowl and let cool slightly (you want it to be warm to the touch). When warm, add in the sugar, vanilla, salt and reduced stout and mix until combined. Add in the eggs, one at a time, mixing after each addition until just combined. Add in the flour and gently fold into the mixture. Pour the mixture into the prepared pan. Bake for about 45 to 55 minutes until a toothpick inserted into the center comes out clean and the surface of the brownies starts to crack. Transfer the pan to a wire rack and let cool completely (don’t try to remove them until they are completely cool!). Once cool, lift out of the pan using the foil overhang. Set on a cutting board. To make the frosting – add the butter to the bowl of a stand mixer fitted with the paddle attachment. Beat on medium speed for about 2 minutes, until light and fluffy. With the mixer on low, slowly add in the confectioners’ sugar. Once incorporated, increase the speed to medium and beat until well combined. Add in the salt, vanilla and irish cream. Beat on low speed until incorporated and then increase the speed to high and beat for about 3 minutes, until fluffy. 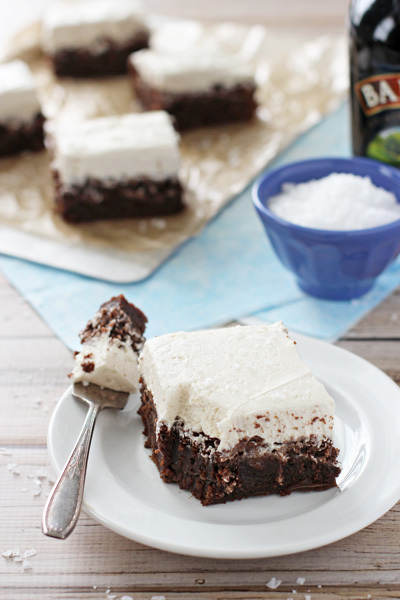 Spread the frosting in an even layer over the cooled brownies. Sprinkle lightly with some flaky sea salt. Cut into bars. Brownies adapted from Foodie Crush. Originally from Bon Appetit. Frosting barely adapted from my irish cream cupcakes.